Maria Sharapova weight: Does the public have the right to know how much women’s tennis players weigh? And does the public have the right to know? Well, we can say for sure that she’s 6-foot-2. 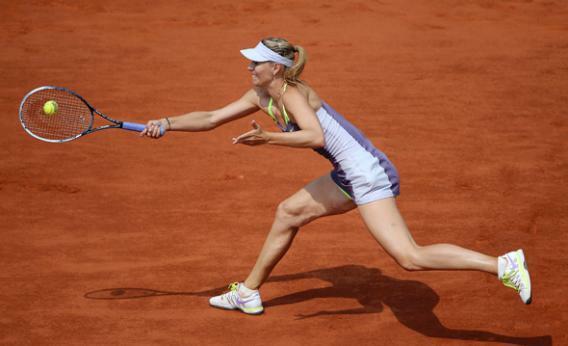 In every way, the 2012 French Open women’s singles final appeared to be a mismatch. Maria Sharapova, the winner of multiple grand slams, towered over Sara Errani, who was in her first grand slam final, in both size and stage presence. As the two 25-year-olds met at the net for their pre-match photographs, Errani barely cleared Sharapova’s shoulder. There was one listed category in which the 5-foot-4 ½ Errani led the 6-foot-2 Sharapova, though: weight. According to their Women’s Tennis Association profiles, Errani weighs 132 pounds, while Sharapova comes in at 130. But in person, as well as on television, Sharapova—who did not play at the U.S. Open due to a shoulder injury—hardly looks gaunt. While undoubtedly slender, she has broad shoulders, toned arms, and muscular legs. In other words, it would not take a trained carnival weight guesser to estimate a number well north of Sharapova’s listed 130 pounds. While Sharapova’s measurements are the most outlandish on paper—she is the only one of the 110 players in the 2013 WTA Media Guide with a BMI less than 17.5—she’s hardly the only player whose listed weight fails the eye test. When compared against one another, or simply against logic, many of the players’ weights seem very, very wrong, all somehow erring on the low side. The 6-foot Kristina Mladenovic, the only other player in the media guide with a BMI under 18, is listed at an incredible 132 pounds. Caroline Wozniacki, who is 5-foot-10, supposedly weighs a paper-thin 128. The point here is not to shame these women for weighing more than what is listed. Rather, the bigger issue is why the weights of women’s tennis players are an official statistic in the first place. Because there’s no compelling reason for us to know how much Maria Sharapova or Caroline Wozniacki really weighs. Why are the listed weights of women’s tennis players so inaccurate? While vanity is undoubtedly a reason, another is simply outdatedness. Players fill out their WTA player information cards when they first make it on the tour, typically as teenagers. Though players are inclined to submit new heights as they grow taller, adding a parallel increase in the weight column is not as natural an impulse. The men’s and women’s tours rely on the players to report and update their own heights and weights, a fact that recently led John Isner to move into a tie for the title of “tallest man in tennis” at age 28. Men’s players, according to ATP representatives, do regularly change their official weights after adding muscle or beginning a slimming nutritional regimen. But the men, too, are not immune from fudging the numbers. After qualifying for the ATP tournament in Cincinnati in August, 18-year-old Mackenzie McDonald told the press that he’s hoping to improve his physique, saying he only weighs 140 pounds, or 142 “on a good day.” After his press conference, an ATP representative gave McDonald a player information card to fill out, and he bumped his weight up to 145. That sort of rounding error is minor, however, compared with what’s standard for women, according to players and tour insiders. A representative of the WTA says the tour tries to make sure listed heights and weights are “reasonable,” but could not recall a submitted height or weight ever being rejected. Unlike the men, women who add muscle rarely contact the tour to adjust their listed weights, and so the numbers stand, presenting often wildly unrealistic ideals for those who might look to emulate the players’ proportions. Proving Perrotta somewhat wrong, Williams would go on to win the tournament, dominating Sharapova 6-1, 6-2 in the final. But proving him somewhat right, Williams is one of the few players in recent years whose listed weight has increased. In late 2007 the figure on Williams’ profile was bumped up to 150 pounds. In late 2011 it would be adjusted again slightly, to 155 pounds, where it has stayed since. Serena Williams has actually adjusted her listed weight upward over the years. Did any of her fellow players notice the change? I asked several of the top women if they ever looked up an opponent’s weight before a match. The pressure is not only on everyday people, but on up-and-coming players. Taylor Townsend, the 2012 Australian Open junior champion, had her weight turned into a flashpoint after the USTA initially benched her from playing in tournaments so she could get in shape. The 17-year-old Townsend, who has played infrequently at the professional level, has not yet filled out a player information card, so the “weight” line of her WTA profile remains blank to date, but will need to be filled in as soon as the WTA decides she has become a prominent player. College athletic departments have thought along these lines for years, declining to publish the weights of female athletes. This is immediately noticeable in sports such as basketball, where the men’s roster will nearly always have each player’s weight listed, while the women’s roster lists none. Unlike the NFL, where potential players are weighed and measured for drafting purposes at a league-sanctioned combine, there is no party in tennis that would stand to gain from knowing a player’s weight. The WTA representative I spoke to agreed that weight was not vital to publish, but said removing the statistics “would be more of an issue than leaving them in,” adding that the category was already built into television graphics. Broadcasters, however, say graphics can easily be changed, and that a player’s poundage gives little insight into her playing style, and therefore isn’t necessary to tell the story of a match.